WARNING THIS PLUGIN IS ONE GAME PER SERVER. MULTI ARENA IS NOT SUPPORTED YET. BUT SOON!!! 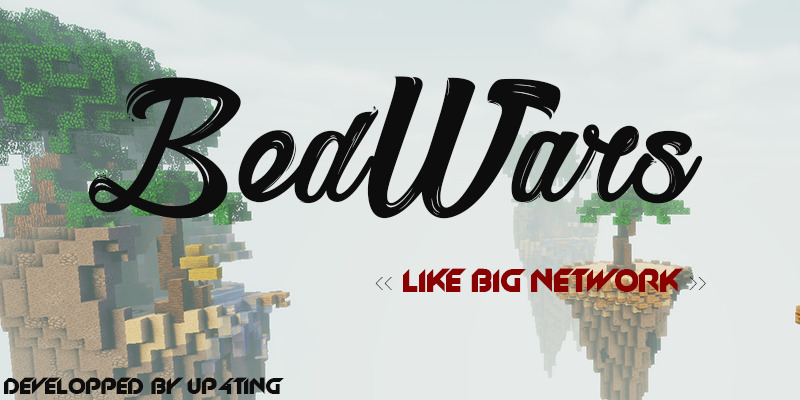 ✦ Bedwars is a game where you need to gather resource, buy items, destroy enemies beds and fight to be the last man standing! This addicting game mode will be an amazing addition to any network big or small. ✦ Why is it the most powerful Bedwars plugin? It's just simply because everything is customizable from the moment you enter the game to the message that gets sent on your way out, everything is customizable! There are a lot of features that you can use to make the game unique to fit with your own network to personalize the experience to fit your community alike! You have more features than any other Bedwars plugin! BedwarsReloaded was designed with networks in mind, you get to control this for your network! SuperBedwars was built with a powerful scoreboard system. SuperBedwars's scoreboard was built with a highly efficient anti-flicker scoreboard that will ensure that your scoreboard will stand out from all the other servers! You can also customize it how you want with many variables to add uniqueness to allow for a network that you like! Just take a look at the highly detailed scoreboard.yml, if you have any questions with the scoreboard, we got awesome support! If you are more visual you can go to the section "Video" and look the setup video! ✦ Upgrade shop SOLO and TEAM! ✦ Stats (wins, kills, finalKill, death, and more)! ✦ Spectator System with the ability to teleport to others players! ✦ Force start the game with /game start! ✦ /game config start/stop: Start/stop config mode! ✦ /game revive <playerName>: Revive a player! Check out this Github to get some already done translation! Bedwars offers basically the best support possible. We offer support in 3 Languages which are English, Spanish, and French. We also provide support in 3 different places in which we are very active on. I can say as a buyer of a lot of premium plugins on spigot we offer one of the best support on spigot! Remember only use support from here! Click here for Private Message Support! Click here for Discord Support! Reviews are one of the most important things to a developer so we are very happy to get reviews and we thank you everyone that done one! 2 - You may not decompile/modify the code, without permissions. 3 - Only use it for your server/network! 5 - No stupid reviews, such as (Its missing features! or the dev isn't adding features I request) Because the features are on the main page! and you knew them before purchasing, so no complaining! ProVN, netlangthien, Zed the Cat và 11 người khác thích điều này.